Hip flexor pain is felt in the upper groin region. It’s not only uncomfortable, but it can also inhibit mobility and prevent you from doing both normal daily tasks and athletic activities. Like any other type of injury, it’s best not to ignore hip flexor pain. The sooner you treat it, the faster you may recover and return to your usual routine. Hip flexor pain in athletes can be caused by a number of factors. Soccer players or dancers might experience an overuse injury from repeatedly kicking with the leg. Any type of athlete can experience an acute hip flexor injury by overstretching, receiving a direct blow to the hip, or as a result of poor conditioning. You can do your best to help avoid a hip flexor strain by stretching before and after activity and properly warming up. 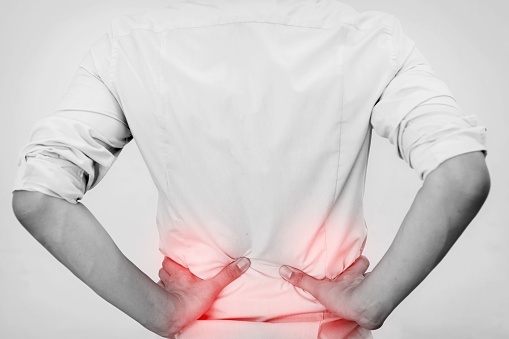 Hip flexor pain in non-athletes is most often caused by prolonged periods of sitting. When in a seated position, your hip flexors are contracted. Think about flexing any other type of muscle—it takes work, and too much of it may cause soreness or muscle strain. The same thing happens in your hip flexors when they are contracted all day long while you sit. This is why it’s a good idea to take periodic stretching breaks or use a sit/stand desk when possible. Compression therapy is the “C” component of RICE therapy, and it can be applied in two ways: static or active. Static compression is essentially applied by wrapping a bandage around the affected area to provide consistent pressure. This helps reduce swelling by preventing excess fluid from building up. Compression braces or clothing can also be used, but they typically do not allow you to adjust the level of compression. Although compression therapy can be applied on its own, it generally works best in combination with the other components of RICE therapy. Compression therapy may be a good fit for those suffering from hip flexor pain or injuries because it helps reduce swelling and supports a faster recovery. While it’s being applied, compression helps gently support the hip flexor muscles while increasing circulation to the area. Compression therapy and cold therapy generally work best when combined together because the combination allows therapeutic cold to penetrate deeper into damaged tissues and last longer. Because the hip flexor muscles are not close to the surface of the skin like many other muscles, compression therapy can be particularly beneficial for bringing therapeutic cold, oxygenated blood, and nutrients to the injured area. If you have ever tried to apply static compression therapy to a hip or groin injury, you know how difficult it can be to wrap a bandage around the area to get consistent pressure. IPC therapy is delivered through an easy-to-apply wrap, so not only may you get better results, but treatment is also more convenient. For more info, see our Guide to Accelerating Hip & Groin Recovery.